We decided to resurrect the Christmas Day Lunch which last happened in 2011. 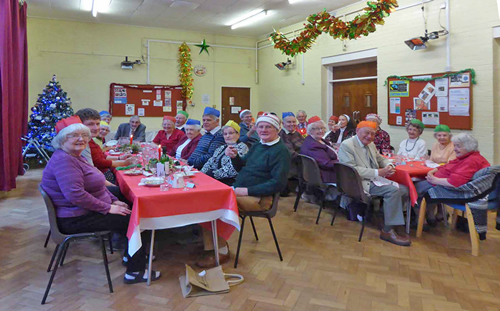 We had a lot of support from the congregation – donations of food and gifts, table decorations, help beforehand and on the day. All our helpers on the day were also our guests and thanks to their help and support we were all able to sit down to lunch together. Throughout the meal there was a general hubbub of conversation and we actually had to call for quiet so we could listen to The Queen on the TV at 3 pm! It all went very well and we certainly enjoyed it and felt it was definitely worth doing. I very much hope that it will now continue as a yearly event on the church's calendar.